New Mini Convertible spied on video | What Car? A What Car? 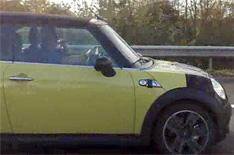 reader has sent us exclusive video footage showing the new Mini Convertible. The video was taken on the reader's mobile phone, after the new car was spotted on the M40. Click below to see the exclusive footage. We'll have official images and details of the car at the end of the month, so keep visiting whatcar.com to get the full story. If you see any disguised cars when you are out and about, send them to us and we'll give you something nice from the What Car? goodie bag if we publish your work. Remember, don't do anything silly - like trying to take a picture while you are driving. https://www.whatcar.com/rss/whatcarvideo.xml. If you don't have iTunes, go to www.apple.com/itunes.